Lewis Johnson is a sports reporter. He is one of the few sports broadcasters to have worked for ABC, NBC and CBS. He has also worked for Westwood One, ESPN, the Pac-12 Network and Turner Sports. The 6' 6" Lewis placed 8th in the 800 meters at the 1987 NCAA Championships with his personal record of 1:47.00. Lewis is a graduate of the University of Cincinnati. 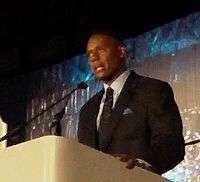 Johnson has worked for NBC since the 2000 Summer Olympics. He has covered Notre Dame football, the NBA, and the AFL as well as 9 Olympic games. He has also worked for NBCSN, the Pac-12 Network, ESPN/ABC, CBS Sports and Turner Sports as well as Westwood One.